address and assured the club that the Republicans were gaining ground each day as the campaign progressed. At 9:30 P.M. the Hon Wm. F. Broening a prominent attorney of Baltimore arrived and delivered an address that will be long remembered by the Republican Club of Boonsboro, as he proved himself an Orator of rare ability and for one hour and thirty minutes he held the undivided attention of the Club and at the conclusion of his remarks the President moved a unanimous vote of thanks for Mr. Broening’s most excellent address which was responded too by every one present and the evening closed with three hearty cheers for the Hon. Wm. F. Broening. The Republican Club of Boonsboro met on Saturday Oct. 27. The minutes of previous meeting were read and adopted. Bill of Boonsboro Times for printing $3.35 was passed and ordered paid. Dr. Wm. Wheeler, David S. Nicodemus and Hubert Young were appointed as a committee of three to collect sufficient means for Election Returns and to seal contract for same. Samuel E. Young, Dr. Wm. Wheeler and F. E. Newcomer were selected as a committee to secure proper heating for the Club Room. 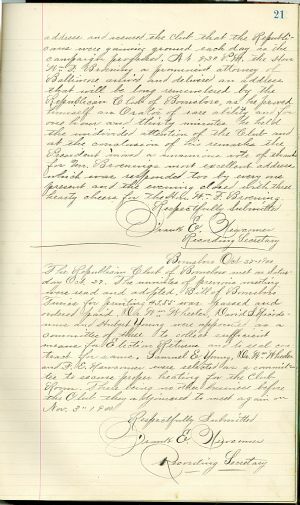 There being no other business before the Club they adjourned to meet again on Nov. 3rd, 1900. William Frederick Broening (1870-1953) was a member of Maryland state house of delegates, 1902; mayor of Baltimore, Md., 1919-23, 1927-31; delegate to Republican National Convention from Maryland, 1920, 1924; candidate for Governor of Maryland, 1930.